My kids and their friends at school will celebrate Earth Day with a spring science project. They will plant flower seeds, tomato and other vegetable seedlings to commemorate the occasion. That kind of commemoration of Earth Day, I can live with. I don't know of anyone who doesn't want to live in a place with clean air, clean water and green surroundings. But the fear-mongering by radical environmentalists about man-made global warming is just too much for me. What are a few inconvenient facts, like the earth is in fact cooling instead of warming during the last decade, and that the Antartic ice is growing instead of melting to these global warming mongers? For those who blame man as the main cause for global warming, one way they can help, is to remove themselves from the face of the earth. That would help the planet, won't it? To hear them say it, every little thing we do to help the planet helps, right? On this Earth Day, I recommend two common-sense editorials from Investor's Business Daily. Firstly, The Late Great Planet Girth, and secondly, Save Capitalism. If you have the time, I recommend all their past editorials on the subject of global warming. Happy Earth Day, and stop worrying that the Earth is on the precipice of man-made disaster. It is not. I was at a hardware and gardening supply store last weekend and fell in love with some of the patio furniture sets that were on display. I've never bought any patio furniture before and wondered if this is the year I would do it especially now that I have a real garden going. But when I looked at the prices, I wasn't so sure I was willing to pay that kind of prices for patio furniture. I was thinking, if I were to put aside money for furniture, I'd rather spend it on a leather living room set that I'd been wanting to get to replace the old sofa set in our living room. I have been wondering if prices for furniture at Direct Buy are as good as the people, on the ads that we see on TV and hear over the radio, claim. I mean, there's a membership fee involved before we can even step into the store! But then again , in the long run, especially if I plan on buying more than just furniture, I can see the membership fee paying for itself through the savings. Direct Buy stores like Direct Buy Houston, are everywhere, and there's even one not that far away from where I live. Direct Buy is even offering Free Visitor's Passes, and maybe I should get one so I can check out the store for myself before I decide if it worth my money to pay the membership fee so I can shop there. I mean, besides living room furniture, I've always wanted to upgrade my kitchen cabinets, my kitchen counter tops to marble counter-tops, and remodel my bathroom while I am at it! Who doesn't want to save money, especially in the current economic climate? In the spring of 2005, Doug bought a pair of goslings. A male and a female. The following spring the female started laying eggs, and hatched 11 goslings. Unfortunately, one died a few days later, drowned in a basin of water. We lost two more last year, one succumbed to injuries sustained from who knows where, and one got eaten by a predator. Last month we lost three in a span of two weeks, most likely the victims of a hungry coyote. When there were still 10 of them. Early this year, the geese started to separate into three distinct family units. We only discovered this fact when we started putting them in two pens (we did not want to lose any more to the coyote!). In one pen, there were four geese and in the other, three geese. One goose, a male, in the pen of four, was always being pecked on by the others. He managed to squeeze himself out of the pen one night, and the first thought that came to Doug's mind, when he saw the dented gate and one missing goose, was that a coyote had manage to grab the goose from the pen! Doug was so angry that day that he ordered some traps, traps that are illegal in California! But the funny thing was, the goose had escaped from the pen! He couldn't put up with the pecking from the other geese any more. It became apparent to us that this lonely goose had lost his mates to the coyote. 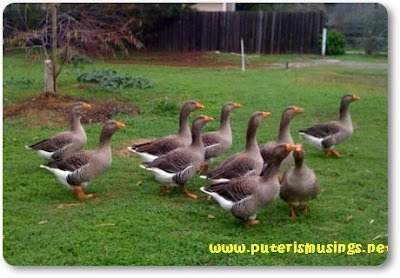 No wonder the other geese did not want to have anything to do with him because he belonged to another family unit. We let this goose stay in the fenced area in our back patio, and there he has been for a while now. This is where our friend, Cory, comes into the picture. Cory stayed in our trailer parked at the side of our house, one weekend, to help us watch our geese while we visited our other home in Los Osos. He called us daily to update us with the well-being of the geese and informed us that he had befriended the lonely goose. They're buddies now, he said. I am still amazed at how Cory is able to tame this goose! He calls the goose over, the goose goes over to him. 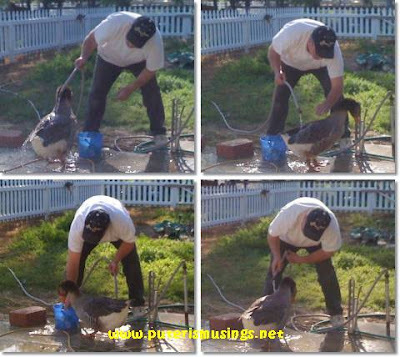 He pats the goose as he would a dog! However, don't for one minute believe that the goose is as friendly with just anyone! He still puts his neck out and tries to chase anyone he doesn't like! Duncan, my 5-year-old, has been pecked by a goose or another many times! This particular goose came after me yesterday. I was trying to let it out of the fenced patio area since we had fenced off the entrance where a coyote could have entered the backyard. But the stupid goose instead charged at me and managed to peck me on my knee! And it kept charging at me! You should have heard me scream! This is the first time I'd been bitten by a goose! Amazing how a goose peck can bruise you! Doug asked me, "Does that mean we are going to have roast goose for dinner?" He'd been asking me for the longest time when we were going to feast on our geese!! Those are pets! No matter how vicious they can be! And they've been very good about providing us with eggs that Doug has turned into salted eggs. 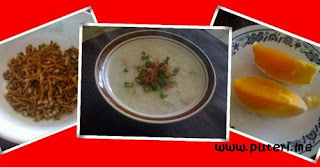 Yummy, best eaten with rice porridge!